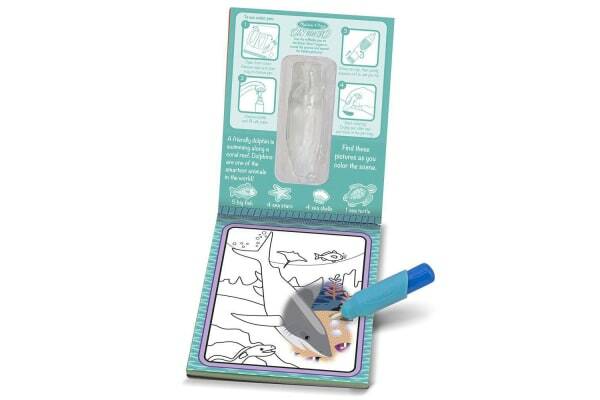 The Melissa & Doug On the Go Water range is designed to get kids painting without paint. Just fill the refillable pen with water and away they go ! 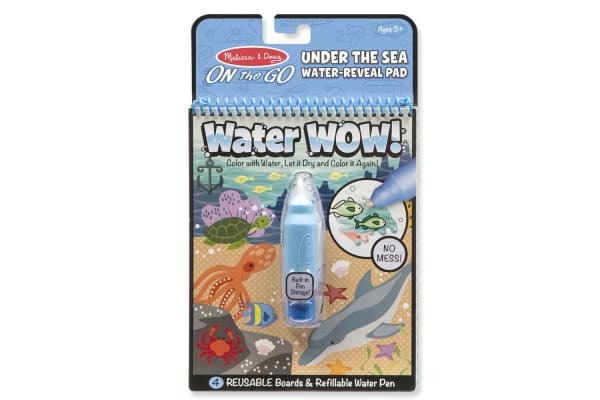 Perfect for car trips or a quick creative play on the road, the Melissa and Doug On the Go – Water Wow ! Under the Sea is perfect for children who enjoying painting and colouring and is completely re-usable. This re-usable colouring and painting book has 4 pages with various ocean and under the sea themed designs which when used with the refillable water pen reveal vibrant colours. The Melissa and Doug On the Go – Water Wow ! Under the Sea pages dry over time and as they dry the colours disappear and are ready to be coloured in again. The Melissa and Doug On the Go – Water Wow ! Under the Sea is extremely popular with kids and made especially for little hands. Melissa & Doug toys are made to the highest standards of quality and safety and manufactured with non toxic materials.